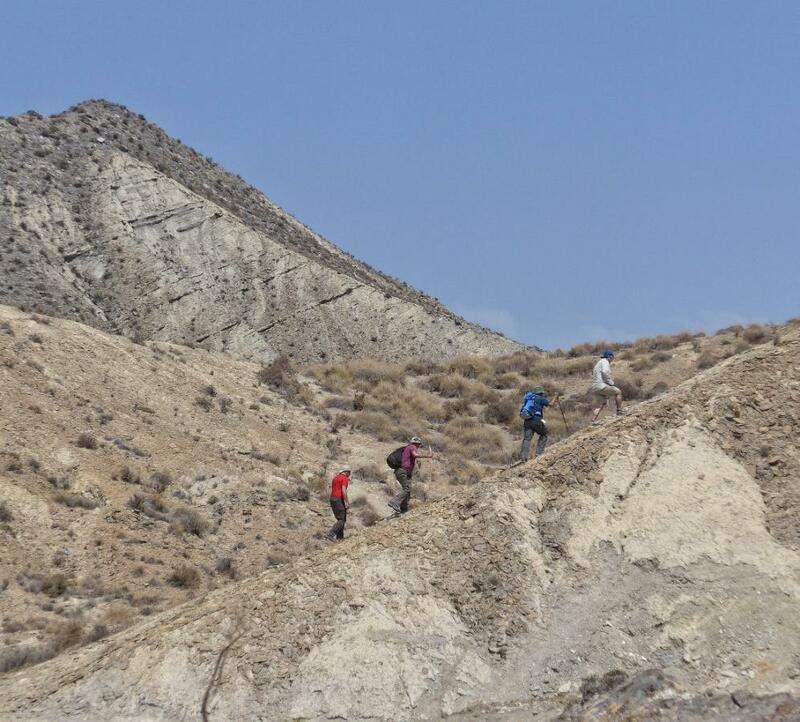 Believe it or not.....the desert area of Tabernas in Almeria offers some fascinating and enjoyable year round walking of the type normally found in North Africa. We can take you on either long multi-day traverses, staying overnight in tents or on simple half day or day walks. The scenery is dramatic and spectacular. Great experience, grand company and fantastic photos. All of your input very much appreciated. Best wishes for continuing success. 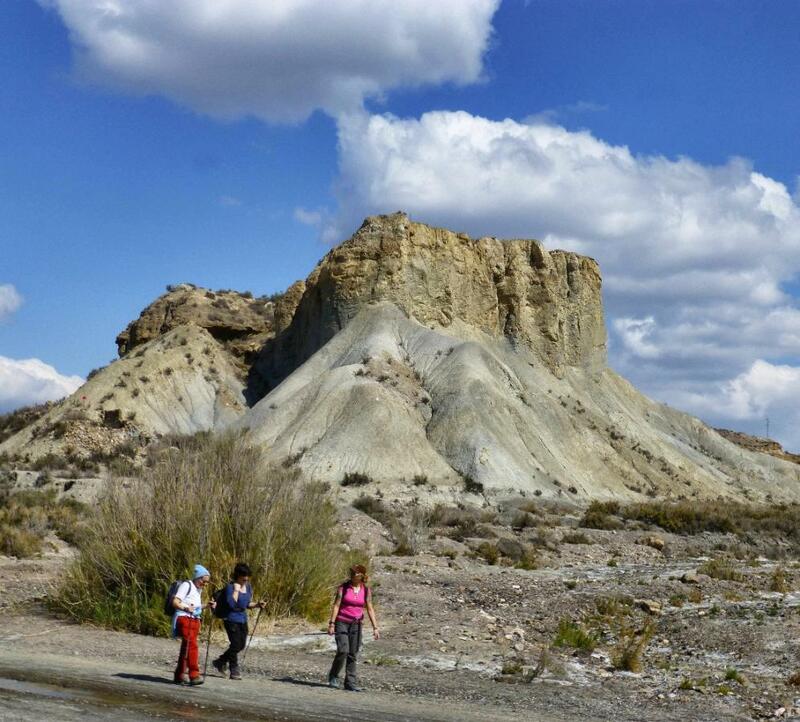 The remarkable, barren badlands of Tabernas in Almeria provide rich walking and hiking opportunities in a truly unique European environment, especially during the colder winter months. We have been walking in these desert regions for many years now. They never fail to provide excitment and interest and our enthusiasm never wanes for this spectacular walking terrain. This area is also famous for the shooting of the "Spaghetti Westerns" and a walking trip to the desert can be combined (for the kids, of course!) with a visit to the film studios and sets.Due to the nature of the terrain we can "tailor" our day walks to the abilities and requirements of our guests. Long multi-day traverses require a certain amount of endurance as the going can be rough and trackless. We run these walks throughout the year but in our experience the summer months of July and August become almost unbearably hot. We have a tour organised to take advantage of the best original locations for such movies as "The Good, The Bad, and The Ugly", "A Fistful of Dollars" and "For a Few Dollars More". We offer a full day's walking itinerary including guide, visiting some of the more famous locations. Also included are film location visits for "Lawrence of Arabia" and "Raiders of the Lost Ark". A very helpful site for more information is the Unique Almeria website. The Paisaje De Cine site also offers a great guide to the movies shot here. Sizzling under a hot Tabernas desert sun! 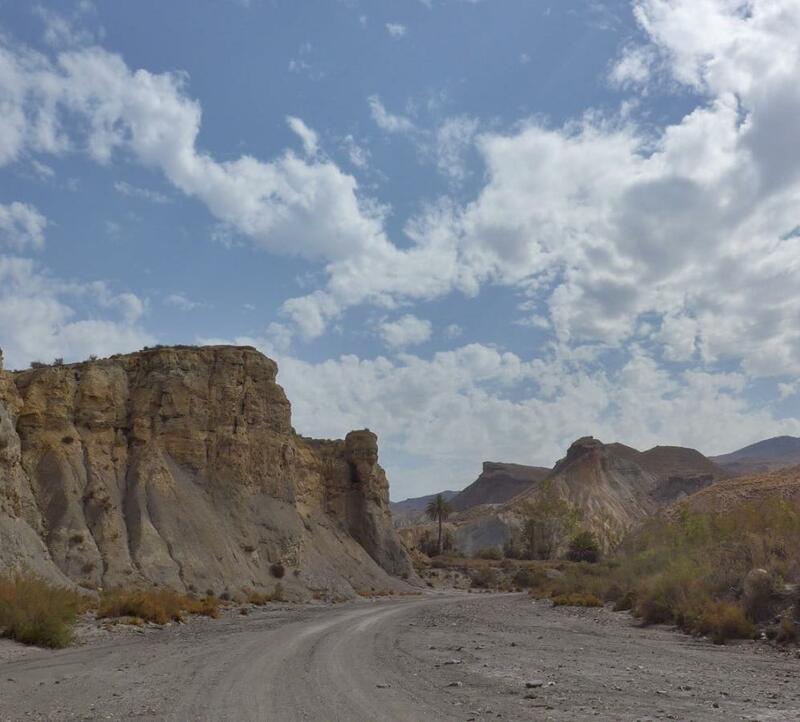 At first glance, once outside of the popular coastal resorts of Roquetas de Mar and Aguadulce, much of the province of Almeria appears to be an inhospitable landscape of stark and arid mesetas. But on closer inspection this is in fact a land of great geographical diversity, offering a surprising range of tourist attractions and activities. To the West of Almeria, the year-round snowy peaks of the Sierra Nevada national park form the highest mountain range on the Iberian peninsula. The summits of Mulhacen and the Veleta prove a challenging climb for avid mountaineers, while this is also Europe`s southernmost ski resort where the views from some runs stretch as far as the Atlas Mountains in North Africa. The less adventurous may prefer to enjoy the delights of the mountain foothills of the Alpujarra to the south. The constant supply of water seeping from the mountains above has created a fertile oasis here, where the resulting landscape of surging streams, lush valleys and forests of chestnut and pine provide a peaceful haven for horse-riding and rambling. Smart Insider Travel Guide to Almeria (Spain), a Top holiday paradise in Southern Spain..
East of here, the mountainous terrain melts quickly away into the epic semi-desert wilderness surrounding the village of Tabernas. This haunting landscape bears more than a passing resemblance to the stereotypical images of the wild west. Not surprisingly, many classic westerns have been filmed here, and the tourist industry has taken advantage, turning the area into a mini-Hollywood of movie nostalgia. The desert and the city of Almeria are divided by the mountains of the Sierra de Gador. The salt lagoons and sand dunes that extend from the foothills are a magnet for birdwatchers, and the village of Gador, as well as Alhabia and Benahadux, are of interest for their traditional cave dwellings, like cosy cottages carved into the mountainside. To the extreme south-east, where Spain meets the Mediterranean at its most South Easterly point, the Cabo de Gata-Nijar national park offers a true sense of escape. Its sparsely inhabited desert landscape reveals the most unexploited coastal gems of the Costa Almeria, its east coast being a haven of deserted volcanic coves with excellent opportunities for diving.